This week's topic is getting around, and I don't mean what happens if you eat too many donuts. A lot of travel in RPGs can come down to your GM waving his hand and declaring your characters are where they wanted to go. But it's a lot more fun when your mounts get brought into the picture. Whether your ride is a battle-trained pure Arabian stallion or a fusion-powered time-traveling DeLorean, transportation can be the key to fun. So what's your favorite ride from any of your RPG exploits? How do you get around when you have the choice, whether by air or sea or ground? Have you ever had a vehicle or mount that was truly bizarre, memorable, or just flat-out fun? It have a mage character in a White Wolf game and mages are considerably different then in D&D It is not class based so the regular mage steriotypes don’t neccesarily fit. Anyways my character is a Parkour enthusiast. His best skild is athletics and he travels mostly by foot but is fit, agile and skilled enough to get most places (in town at least) as quick as the rest of the group by car. He doesn’t have to stop for lights or travel only where roads are. My favorite would have to be my fighters lance and fully armored rhino combination. So much devastation…so much fun! My group, The Celestial Knights, flew on giant eagles. I actually had a lot of fun with it and did things with that baby that the GM never thought possible. My D&D group usually doesn’t have mounts or anything other than PCs. Our next campaign will have a mule, though. And he won’t like the sound of laughing. I remember my first RPG experience, where two characters had boats, and we stuck wheels on the boats so they would function as carriages. Then we had a lesson on equestrian lore from the DM (who explained the difference between a mule and a jenny), and ended up getting two mules to pull the boat-carriages. Later on, one of the mules was eaten by an ogre who bought it off of us. In our Middle-earth campaign, at one point it became obvious that we needed horses, and so we set out to buy ourselves some. Our magician named his steed — a near-albino jade with a foul temper and tendency to bite — as “Sauron” (this was way before the War of the Ring began — about 1,400 years earlier). Despite this, he grew fond of the horse and managed to escape her nasty bite through well-timed dodges. Meanwhile, my character found a BIG war horse, with grey pelt and black mane and tail; he was like a tank version of a horse, solid in build and roughly as graceful, but once the stallion got going, there was nothing short of a giant or a dragon that would stop it. Despite this, it had very placid temperament, and seemed to regard the world with a calm outlook. I returned with my purchase, and others gawped at the horse. “What’s his name?” they asked. It turned out that Mouse had a bit of a character flaw, namely, large bodies of water or rivers got him slightly excited. And, just like I noted before, once he got going, nothing was going to stop him. Crossing the rivers became a bit of an adventure because Mouse waded in, and delighted in swimming around, and it took quite a while until he got tired of that and decided to wade back to the shore. The only thing you could do was to just hang on and let the horse swim if you lost control, and try not to fall off. 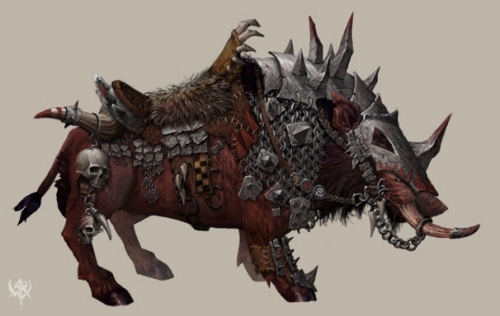 In a D&D3.5/Forgotten Realms campaign, we had an another unique case of a steed. Which was a player character, namely mine. Initiative is rolled. No matter what initiative the rogue gets, he delays himself immediately after Rhea. Rhea charges at the enemy, bites. If the trip attack is successful, she savages the downed and prone foe viciously with a new bite. If not, ah well, but a bite is a bite. The halfling rogue then reaped bonuses from both prone target and attacking from higher ground, or Tumbled to the flank of the prone foe to put a sneak attack in. Target has the choice of trying to fight from the ground with a penalty or getting up and facing an attack of opportunity from two angry attackers. When Enlarge Person was tossed into the mix, it became even more terrifying… because it meant Rhea could trip Huge opponents. It was a horrifyingly well-working synergy between two PCs, and we wrecked the best-laid plans of our foes quite regularly. I hope you’ll forgive an off-topic comment, but I don’t do RPGs. I’ve been offline for several days, and this is my first look at the site redesign. As the saying goes, “I love what you’ve done with the place.” It’s much cleaner and easier to read than the old layout. Skiriki remininded me of a Rolemaster Campaign I was playing in as well. While not an unusual mount story exactly it does involve an unusual way in which a month was handled. The party was currently in Rohirim lands. One of our party, named Slagard was trying to woe a Rohirim las and her the head of her brother didn’t like the idea much because Slagard wasn’t much of a horseman. He wanted his sister to marry another Rohirim. In order to add credence to his argument he asked Slagard how well he could handle a horse (of course this was in front of the Hui-Thaine and his court. Slagard knowing that he was a poor horsemen decided to do what he was good at. He walked over to a horse and literally picked it up over his head. The girl’s brother’s argument lost its wind and there was a marriage a few months later. In our Werewolf the Apocalypse campaign(post-Apocalypse setting) My character rode around in a Abrams tank he painted Candy cane strip. and it had a demon called a chimera bound into it. Werewolf exists in two worlds, here and the Umbra(Spirit world). Here it looked like a massive tank painted red and white stripes, in the Umbra it looked like a rolling mass of teeth, claws, and eyes. Thanks for the kind words Niall, and glad you’re back online. Oh! All this talk about gryphons reminds me of a time our PCs were sent to tame gryphons to act as steeds for the forces of Waterdeep. We managed to pounce on a group of them, and the druid applied some kind of mystic dust (which blew up as a cloud around us), which when inhaled made the gryphons more friendly towards us (read: they wouldn’t rake us to shreds right away), and we were able to do our tricks in order to convince the beasties to act as steeds, albeit while trying to wrestle them into submission. The gryphon which the druid was trying to wrestle decided to take off, and she clung to the beast and sweared through a list of gods as the thing was trying to shake her off. She failed a Ride check; the DM told the player to roll a Ref save, and she failed it narrowly. Now she was hanging on to the wing of a gryphon, while the beast was stalling. Since the check was failed by 1 or 2, the DM said to roll again, to see if she can grab a better hold a haul herself back to the gryphon’s back. She rolled a natural 1. The end result was that she grasped one wing with her left hand, the other wing with the right hand, and suddenly she was falling, holding two wing feathers in her clutches, and plummeting down to the direction of ground, while waving her arms furiously as if trying to use the huge wing feathers to fly. IIRC my character (the only one with ranks in Ride) managed to guide her gryphon underneath just in time, except then she failed her Reflex save and Ride check, and now the druid, the wizard and the gryphon were all plummeting down to the ground. Just once I want to hear somebody say, “one time I had a flying bear in a top-hat” ’cause that would be kinda cool…or and I just weird? My Champions character had a motorcycle with AI. Spent a lot of points to create it. Well worth it! Really added a dimension to the game and combat sequences. Originally, the bike simply added movement and had a headlight (Flash Attack!). The basic model was so expensive, I convinced the GM to allow me to create it as an NPC that he controlled. I added Disadvantages to the Artificial Intelligence to squeeze the Power Pool. The obvious limitations of being a motorcycle. The headlight was an Obvious Inaccessible Focus. The bike was loud. Not just the engine, but its personality. It had a Short-Attention Span (part of the initial design flaw as it “learned” about the world around it). The bike never had a name because it became more than a work in progress. When we would have guest players, some chose to play the bike! We would design the character around the base model. New powers and new personalities to match either the mission, or to represent my attempts at improving the design. A couple of times, they would go rogue. Join the bad guys, get destroyed, or captured and re-worked. My GM eventually allowed the bike to be its own character available only to guests. But, as a bonus, the bike gained Experience Points that carried over. Even when it went bad. On the downside, if the bike was destroyed, all the experience was lost. I would have to start from my original points pool. The GM insisted that there were no blueprints. Unrealistic from an engineering point of view… but it kept things very interesting. Especially when some guy’s kid brother would crash and burn on purpose. Motorcycles in general. Car Wars motorcycle duels were always fun. Designing them. Twisting and contorting space and weight limits. Nothing says ‘Clear the way’ like a giant walking Tank. I gotta agree to a limited extent with PsyckoSama… LAMs are where it’s at. BattleMechs with grossly improbably transforming sequences to turn into spacefaring aeroplanes. Yup. My fave.